Topeka is the state capital of Kansas and the county seat of Shawnee County. It is located in northeast Kansas along the Kansas River. The population of Topeka is about 125,000 residents. The landmark case, Brown vs. Board of Education, Topeka took place in this city. Brown vs. Board of Education, Topeka overturned the Plessy vs. Ferguson case. Brown vs. Board of Education, Topeka ruled that segregation due to race in school was unconstitutional. In the Ioway and Kansa language, Topeka means “to dig good potatoes”. The city was founded in 1854 by folks who were against slavery. In 1857, Topeka was chartered as a city. 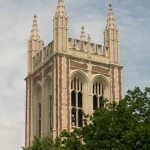 Topeka High School is a fully accredited high school for about 2,000 9th -12th graders in Topeka, Kansas. Topeka High School was originally established in 1817 at 8th and Harrison. In 1931, it was moved to its current location at 800 SW 10th Avenue. It was one of the first million dollar high schools built west of the Mississippi River. Students still play basketball in the “Dungeon” at Topeka High School, largest high school gymnasium in the state of Kansas. The library was modeled after King Henry VIII’s palace. About half of the ceilings are hand painted and the wood shelving is hand-carved. Students report hearing disembodied conversations of ghostly chatting with each other. Strange phenomena are said to happen throughout the school. There are rumors that the school was built on top of an old cemetery, but we have not yet confirmed that this is a fact.